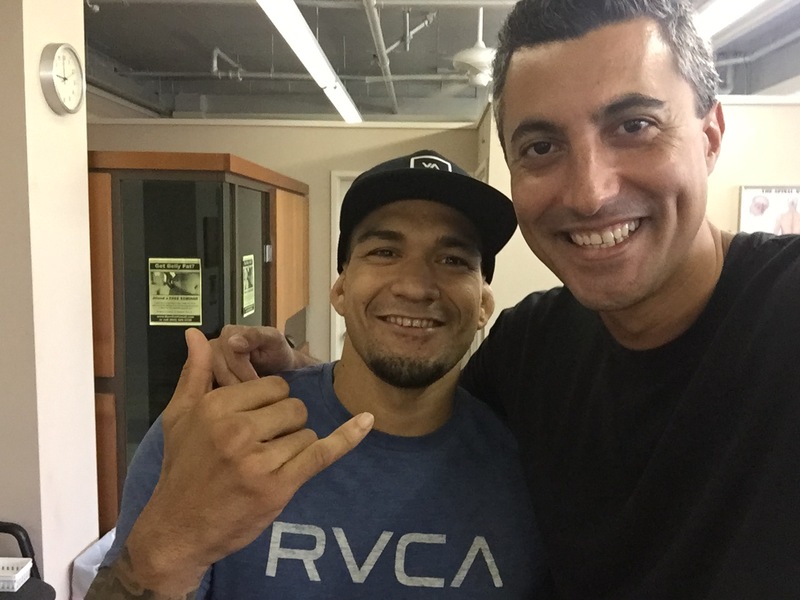 Numbness In Both Hands Gone With Chiropractic Adjustments! 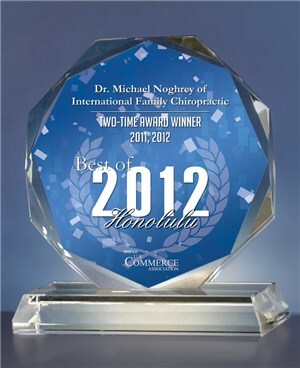 Welcome to International Family Chiropractic! 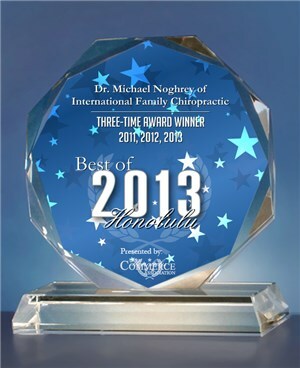 We are pleased to announce that once again Dr. Michael Noghrey of International Family Chiropractic has been awarded the 2018 Best Chiropractor in Honolulu for the eighth straight year in a row! 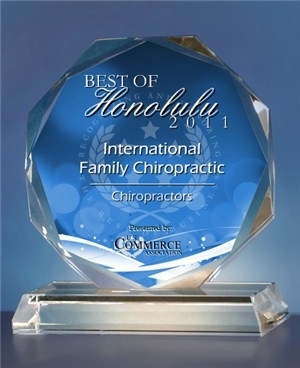 Located in the heart of Honolulu, Hawaii, the leading health professionals at International Family Chiropractic are dedicated to helping you achieve your best wellness objectives -- combining skill and expertise that spans the entire chiropractic wellness spectrum. 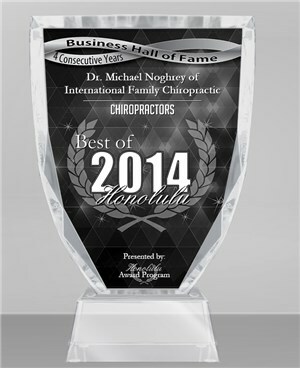 Dr. Michael Noghrey is committed to bringing out your best health and a better way of life by teaching and practicing the true principles of chiropractic wellness care. If you are concerned about whether we can help you out with your low back, neck, shoulder or other spinal pain condition, be rest assured that we have seen it all, worked with all shapes and sizes, and if we can't help you out, we will tell you. 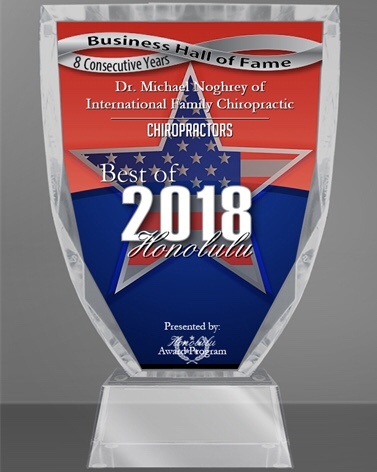 Patients seeking treatment at International Family Chiropractic with Dr. Michael Noghrey are assured of receiving only the best chiropractic hands-on adjustments through years of experience working with high level and professional athletes. 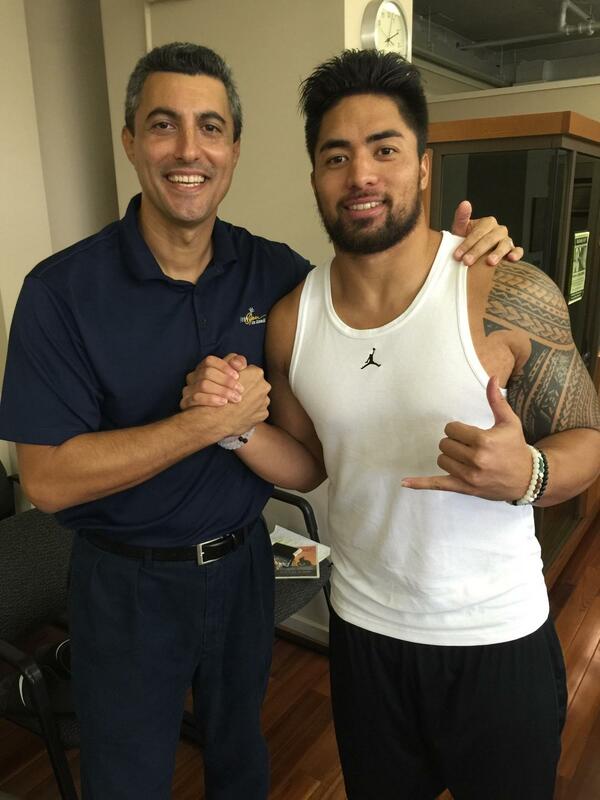 In private practice, Dr. Noghrey has worked on and had his hands on many world-class athletes including members of the NFL (National Football League), UFC (Ultimate Fighting Championship--Max Holloway, Nate Diaz and Yancy Madeiros), MLB (Major League Baseball), NHL (National Hockey League), and members of the PGA (Professional Golf Association--Fred Funk, Jesper Parnevik, Ricky Barnes and Scott Stallings). 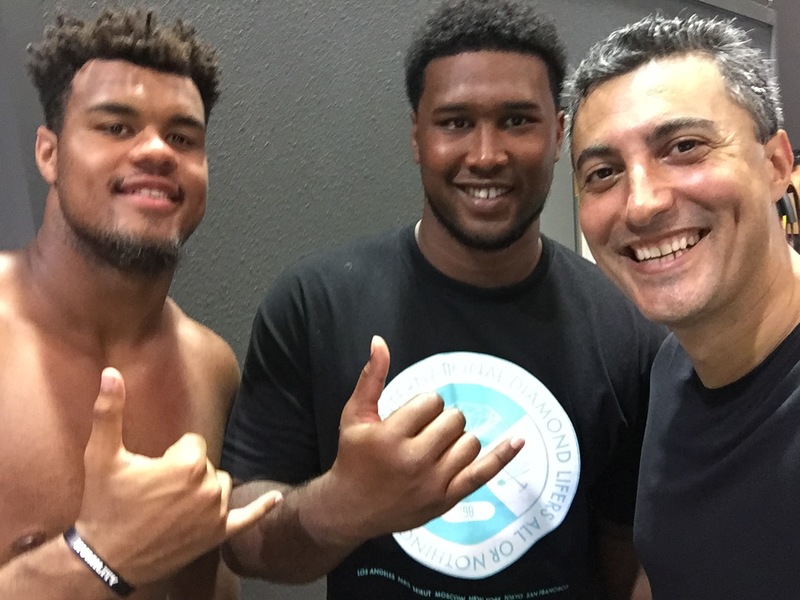 Inside his sports centered Chiropractic office or out training with professional athletes, Dr. Noghrey has adjusted athletes from the San Francisco 49ers (Jesse Sapolu, DeForest Buckner, Arik Armstead), Seattle Seahawks (Michael Bennett, Cliff Avril, Cassius Marsh, Jordan Hill, O'Brien Schofield), San Diego Chargers (Manti Te'o), Detroit Lions (Brandon Copeland, Wallace Gilberry), Houston Texans (Jadeveon Clowney), Oakland Raiders, San Francisco Giants, Oakland A's, San Jose Sharks, University of Alabama (Tua Tagovailoa), USC (Vavae Malepeai), San Jose State University, Santa Clara University, Stanford University, Hawaii Pacific University, Chaminade University, University of Hawaii, IronMan elite triathletes, and Punahou High School Football athletes. 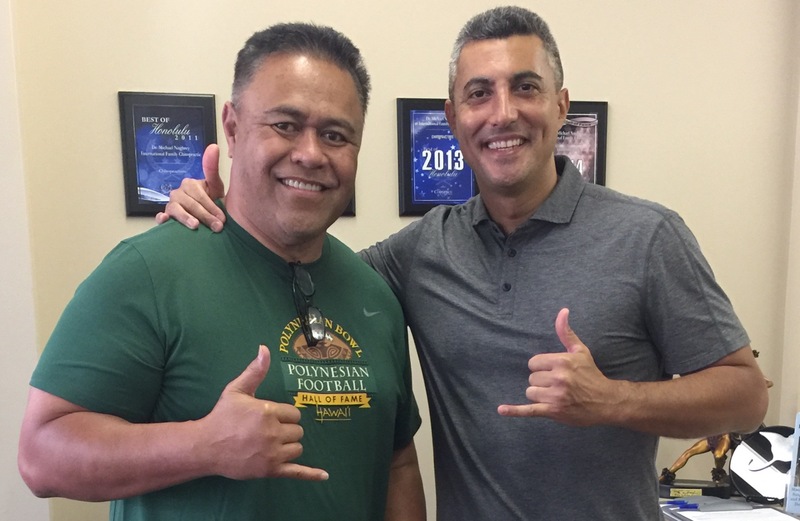 Currently, Dr. Noghrey is the medical staff Chiropractor for the Punahou Varsity Football team as well as the world famous Sony Open golf tournament in Hawaii where he works on the world's best PGA golf professionals at the Waialae Country Club on the island of Oahu. Dr. Noghrey's specialties are extremity injuries to the shoulder & rotator cuff, shoulder bursitis and frozen shoulder, ankle sprains, foot problems including Morton's neuroma, knee and meniscus pain, tennis elbow, arm and wrist pain or numbness- including Carpal Tunnel Syndrome, as well as spinal pain conditions of the neck (pinched nerve) and mid-back including Vertigo, headaches, migraines, TMJ pain, whiplash injury to the neck, pain of pregnancy, sciatic nerve issues- radiating or burning low back pain with numbness or weakness down the leg to the toes, herniated or bulging discs in the neck or lower back and childhood scoliosis. These chronic pain problems are commonly resolved with chiropractic adjustments and/or spinal decompression, along with specific stretches and exercises for lower back, neck, or extremity pain. 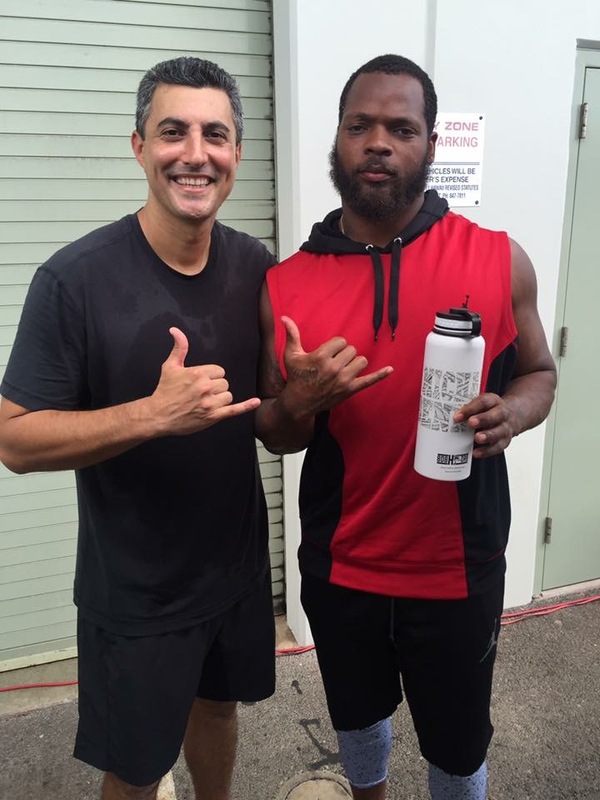 Most important, Dr. Noghrey will want to talk to you one on one about specific stretching and strengthening exercises and how the role of diet and nutrition play in your recovery and healing! 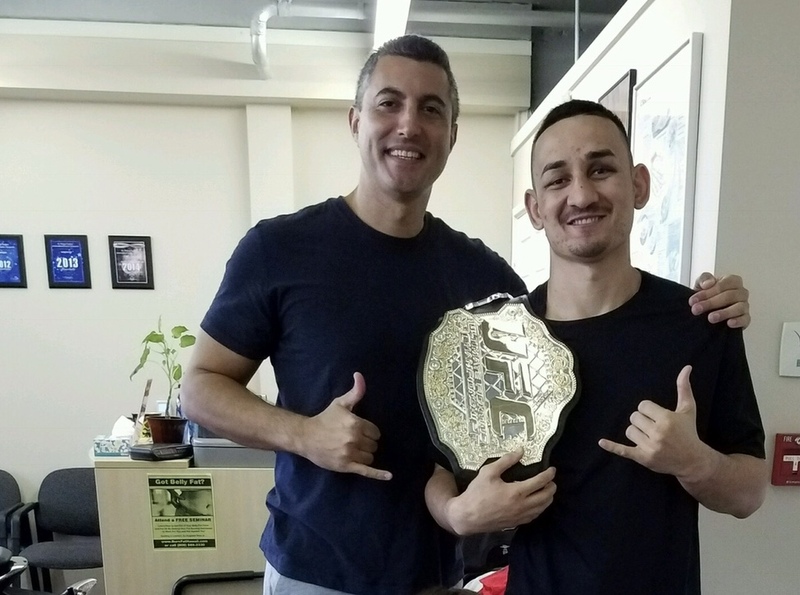 Being a family and sports chiropractor in Honolulu has given Dr. Noghrey the chance to help out a full spectrum of health related disorders with his family of patients. If you or your family- including your children, suffer from ADD, ADHD, Autism including Asperger's syndrome, Allergies, Asthma, Auto Accidents, Birth Trauma (Torticollis or Brachial Plexus injuries), Back Pain-Lower, Back Pain-Upper/Neck, Bedwetting, Cerebral Palsy, Chronic Tiredness, Colic, Stomach & Digestive problems (Hiatal Hernia or Acid Reflux), Dizziness (Vertigo), Ear Infections (Otitis Media), Fibromyalgia, High Blood Pressure (Hypertension), or Multiple Sclerosis, Chiropractic can help you! 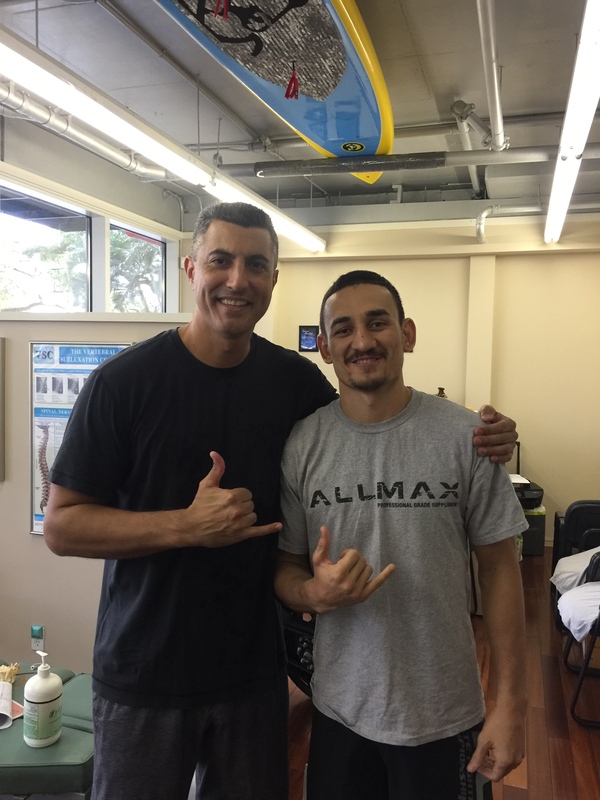 As always, our Honolulu chiropractic office has modern equipment and will continue to offer the best chiropractic care incorporating the safest diagnostic procedures, utilizing the latest in-house Digital X-Ray technology for examination and diagnosis. If you have recently gone to your physician and been diagnosed on MRI with a disc bulge in your spine (slipped disc), herniation in your neck or low back, facet syndrome, sciatica, spinal stenosis or failed back surgery, you may also qualify to utilize the latest in back and neck pain therapy with Non-Surgical Spinal Decompression. Come in and experience the latest Full Spectrum Infrared Sauna to aid in your healing and health goals. Scientific studies show that our Infrared Sauna aids in weight loss, cellular health and immunity, wound healing, skin rejuvenation, pain relief, improved circulation, detoxification, blood pressure reduction, and relaxation! Dr. Michael Noghrey and the staff have a genuine concern for your well-being! If you are new to our website, please feel free to discover and learn about chiropractic wellness. If you are interested in starting your journey towards wellness please subscribe to our award winning newsletter. If you are already a newsletter subscriber, please explore the member wellness section of our website for wellness articles, resources, and health facts---specifically targeted by Dr. Michael Noghrey to your wellness needs and interests. If you or a loved one are suffering needlessly, call us at (808) 589-3330 for a free consultation at our state of the art ground floor Honolulu location in the new 909 Kapiolani Blvd. building, just across the Neal Blaisdell Center on the corner of Ward Ave and Kapiolani Blvd. We have two levels of FREE parking! We look forward to helping you and your family resolve your health issues. 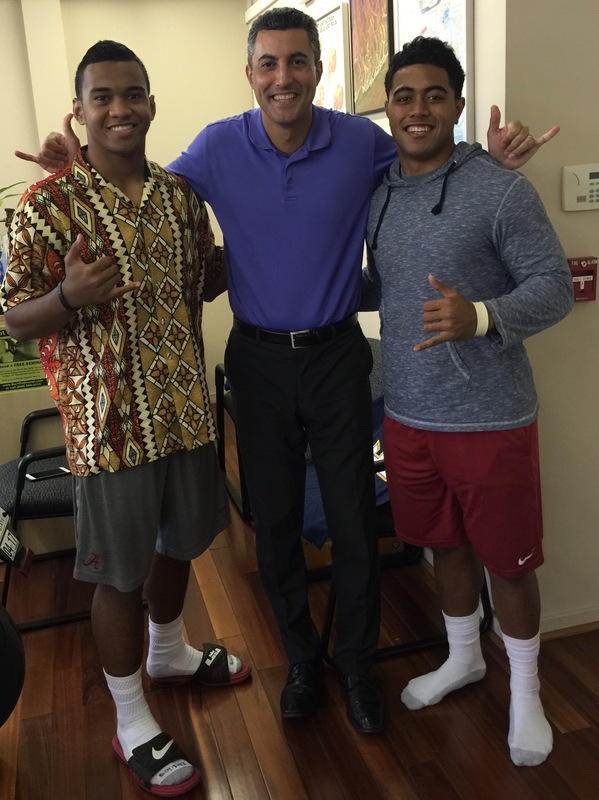 Don't Settle For Less...Come To Hawaii's Best! Sign-up using the form or call us at 808-589-3330 to take advantage of this exclusive offer. "Through the years I have heard countless stories of the remarkable work he has done on various individuals from young to old, sedentary to pro athletes."